Pure flavor doesn't get any purer than this. Pesto, a green sauce made from ground pine nuts and basil (and of course olive oil), is usually identified with the region around Genoa. Sicily's version of green pesto is made with finely chopped, ground pistachios with a touch of mint and basil. Pesto comes from the Italian verb pestare for pounding or crushing. Think of the mortar and pestle, which here in Italy are usually made of stone rather than wood. Sicilian pistachios have been cultivated since antiquity. Most often, those used in pesto are freshly picked - still greenish - slightly dried but untoasted. In other words, they are raw. This, of course, enhances the pesto sauce's green hue. Basil and mint bring out the flavor and color, but pistachio pesto (which contains no other pine nuts or walnuts) should be nuttier than its Genoese counterpart. Pistachio pesto should be at least two-thirds pistachio. 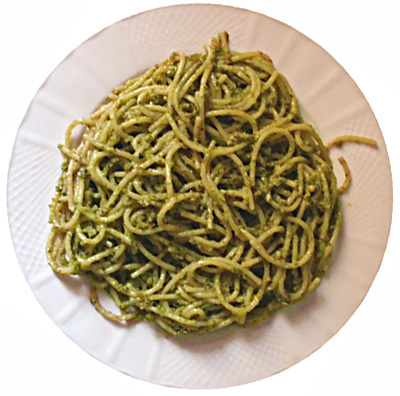 Pesto is usually viewed as a winter food just as fritella is associated with the spring months. Today, with modern bottling processes (pesto is often sold at retail in jars), these generalities need not be seen as limitations. Purists would say that only Sicilian pistachios should be used, but the less dogmatic among us would suggest that any good, uncooked pistachios are suitable. The basil and mint must be fresh leaves, and the olive oil should be the best extra-virgin type you can find. This isn't the kind of recipe where you can compromise on ingredients because that would completely alter the taste. Another point is that a good, long pasta (like spaghetti) should be used. This should be a very high quality, either fresh or whole-grain. I'm partial to spaghetti alla chitarra, which is square rather than round. By the same token, the grated cheese sprinkled over the pesto should be the best available. Culinary history is rarely based on a complete knowledge, but pesto recipes seem to be among Italy's oldest, predating the introduction of New World crops (like tomatoes) during the sixteenth century. Try it.